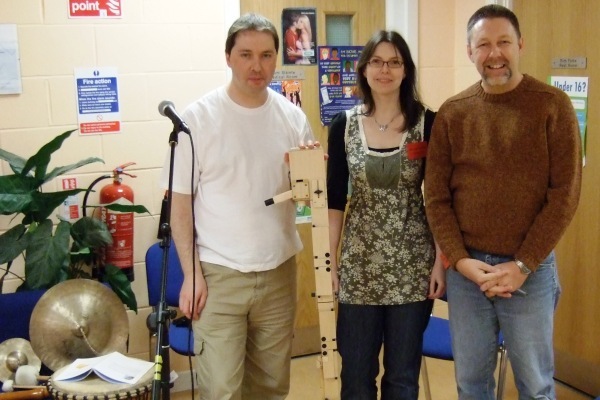 The three founder poets of the Blue Salt Collective, Knotbrook Taylor, Catriona Yule and Haworth Hodgkinson, appeared at the 2007 Àrainn Shuaineirt Book Festival in performances combining poetry and live music. At the Friday night Book Festival Ceilidh they appeared on the main stage of Àrainn Shuaineirt (The Sunart Centre) alongside other festival guests including Gaelic singer Anne Martin, singer/storyteller Julia Donaldson with her husband and co-performer Malcolm Donaldson, childen's author Jonathan Meres, nature writer Jim Crumley, the Ceilear Gaelic Choir and a remarkably talented group of local young musicians. During the day on Saturday they presented four short performances in a corridor outside the medical room and the depute headmaster's office at the Sunart Centre, which on weekdays doubles as Ardnamurchan High School.